The Days of Johann, an agility dog! : The Iditarod. The Iditarod is going on this week - the longest, harshest, most grueling dog sport in the World. Sadly there are reports from LAUnleashed this morning about one of the sled dogs dying yesterday during the race. The reason for the death is not yet know. The Baltimore Sun reports that three dogs died during last years race. PETA, of course, is up in arms. And on the other side of the fence there are those close to the sport, the dogs, and the mushers who contend that these dogs live for this sport. Oh, the controversy. I suppose life isn't without controversy. I, for one, understand what living for something is. I live for agility (and my, Mum, of course). Anytime Mum puts on her agility shoes, or even goes near them for that matter, I get wild, manic, wacky and can't wait to get out in the backyard to run. Mum has to put her agility shoes in the closet because if she walks by them I get wild. Now that they are in the closet, if she walks by it I get crazy. At trials, I pull her feverishly to the start line (when I'm healthy, that is - 'cause you all know that sometimes I'm hurt; much too often, I may add), just itching to get out there and run, as a team, with my Mum. I've done agility since I was 12 months old. I kinda know what it means to be a working dog (even though I am in no way a full time working dog :). I know what it means to want to do something so bad, you just can't hold it in. Heck, Mum has to tackle the sheep to get me to stop herding them, before I would potentially collapse. I think I have to agree that most all of these sled dogs are absolutely hungry to run these sleds. Is the race too long? Maybe, probably. Are some of the mushers not nice to their dogs? Probably, maybe (just like in other sports, just like in life). 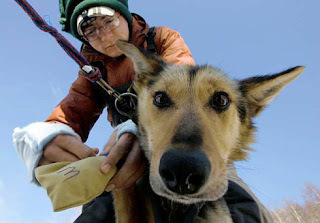 Are many of the mushers really good to their pups, take the best care, and are completely concerned about their dogs? Most probably, and most maybe, (just like in any sport, just like in life). Is the sport dangerous? Yes, just as many dog (and human) sports, are dangerous. So what do I think of the Iditarod? I think it's a tough race, hard on the dogs and on the humans. But I think it's rewarding for many of the dogs who were bred, raised and born to do this. And I also think that many of these dogs love it, and would and do run their heart out till the very end because they want to. Agility is a tough sport on dogs, so is disc dog, so are other dog sports. But we do it because we love it. There are many, many dangers in life; and there are so many things in life that are hard, tough, difficult, stressful; but yet provide us the most fun, the most reward and, perhaps even, the very thing we live for. Photo: Ryan Redington puts booties on his sled dog Columbia as he gets ready to leave the Takotna, Alaska, checkpoint in the Iditarod race. It is what I dream about when I'm sleeping!